This article and the business privilege tax it imposes is enacted under the Authority of the Local Tax Enabling Act 511 of December 31 of the current year, P.L. 1257, 53 P.S. § 6901 and amendments thereto. This article shall go into effect April 1, 1988. Commencing on April 1, 1988, there is hereby levied a tax for general revenue purposes on all persons for the privilege of doing business as herein defined in the township. The rate of the tax on every dollar of gross volume of business transacted within the territorial limits of the township shall be 1 1/2 mills. The tax shall be payable by May 15 of the following tax year. 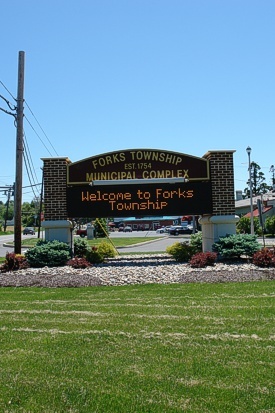 Every person desiring to engage in peddling in the Township of Forks shall first make application to the Zoning Officer or other designated township employee for a license. If such person shall also be required to obtain a license from any county officer, he must, when making such application, exhibit a valid county license. Upon such application, such person shall give his name, address, the name of the person for whom he works, if any, the type of goods, wares and merchandise he wishes to peddle, the length of time for which he wishes to be licensed, the type of vehicle he uses, if any, and the license number thereof, and the number and name and address of the helpers he has. Provided, where a person makes application for himself alone and one or more helpers, all applicable personal information specified above shall be given for each helper, and an individual license shall be required for each helper. No license issued under this chapter shall be transferable from one person to another. A fee as set forth from time to time by resolution of the Board of Supervisors for a license which shall expire one week after the date of its issuance. A fee as set forth from time to time by resolution of the Board of Supervisors for a license which shall expire one month after the date of its issuance. Upon making application therefor and paying the proper fee, as herein specified, a license shall be issued to every peddler. Such license shall contain the information required to be given upon the application therefor. Every peddler shall at all times, when engaged in peddling in the township, carry such license upon his person, and shall exhibit such license, upon request, to all police officers, township officials and citizens. No peddler shall engage in selling any product not mentioned upon such license. No person licensed as a peddler under this chapter shall hawk or cry his wares upon any of the streets or sidewalks of the township, nor shall he use any loudspeaker or horn or any other device for announcing his presence by which the public is annoyed. No person licensed as a peddler under this chapter shall park any vehicle upon any of the streets or alleys of the township in order to sort, rearrange or clean any of his goods, wares or merchandise, nor may any such person place or deposit any refuse upon any of such streets or alleys, nor may any such person maintain or keep a street or curbstone market by parking any vehicle upon any street or alley in the township for longer than necessary in order to sell therefrom to persons residing in the immediate vicinity. 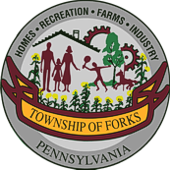 Please contact the Forks Township Zoning Office @ 610-250-2254 for more information.